Those calculations were made using Yagimax antenna modeling software. I think the gain calculations are a little off, but there is definitely a noticeable difference in signal strength, especially on passes of lower elevation. As you can see, you will not even spend as much as you would at family night at the movies for this antenna. Construction time varies depending on how long it takes to get the folded dipole exactly right. The first step is to cut and form the driven element for resonance. Since I try to work AO-27, UO-14, and SO-41, I had to compromise on the center frequency. I chose 436.000. This antenna is going to have a wide enough bandwidth to work up into the 440’s but, if you’re like me and building this for satellite work, you’ll want it at it’s lowest SWR where the satellites transmit. 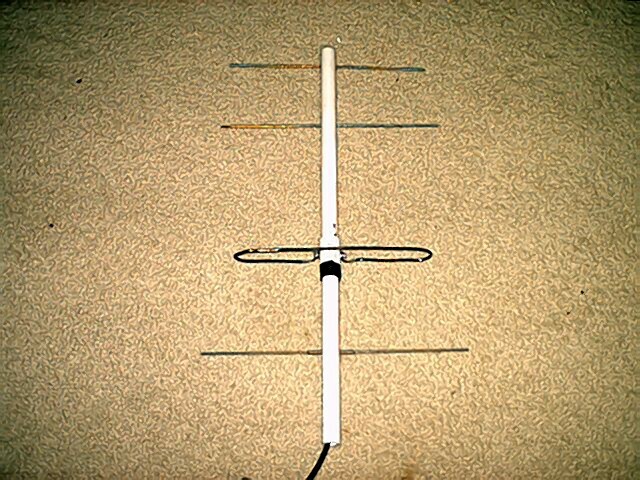 The driven element is a folded dipole which is 10.5″ long and the folds are 1″ apart. You can experiment with this distance, but 1″ seems to work well. 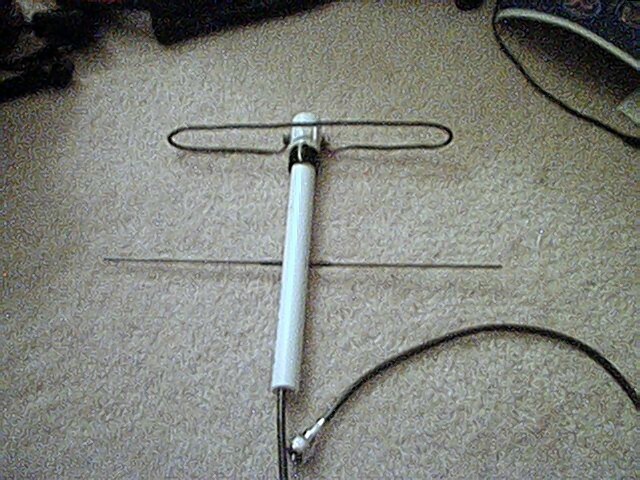 This is virtually the ONLY critical element in this antenna, so make sure you get it right, or you might be disappointed with your results. Next, strip about 1/2″ of wire off of both ends of the driven element and bend them so that they fit around the #6×34 screws. THIS IS THE SINGLE HARDEST PART OF BUILDING THE ANTENNA. Next strip the coax and attach crimp style ring terminals to the center conductor and shield. Run the coax through the 9″-13″ PVC piece (rear piece) and connect the driven element to the coax via the #6×32 hardware (this is a temporary connection to test for SWR). Remember, the more coax you use, the more loss you’ll get! Next, connect the 9″-13″ PVC pipe (rear piece) to the connector joint and tape the reflector about 4.5″ behind the driven element. This part is slightly critical, as SWR may move around depending on the position of the reflector. Find the spot where you get the least SWR and mark it with a pen or sharpie. Next slide the 13″ PVC pipe (front piece) into the PVC center conductor as far as it will go. Mark the spots for the directors, FROM THE REFLECTOR using a ruler/tape measure and the dimensions listed above, with a pen or sharpie. It is also helpful to mark the end that goes into the PVC connector so that you’ll remember after the holes are drilled (If I didn’t do it, I would have installed the thing backwards). Drill the holes install the welding rods through the boom and connect the boom. There, you’re done. Check the SWR (should be negligible if you’ve done everything correctly) and enjoy. You can put a PVC cap at the end to give it a more finished look, and I definitely recommend sanding and painting the welding rods. Mine have oxidized a lot and I have never gotten the thing wet although oxidation will not effect performance much, if at all. Also, you might want to place electrical tape at the points the directors exit the boom to keep them from sliding around. Also, electrical tape at the joints of the PVC and center connector joint will keep the PVC from rotation around and throwing off the alignment of the antenna. Enjoy, and many thanks to Jerry, K5OE for the initial idea and kind words of encouragement.